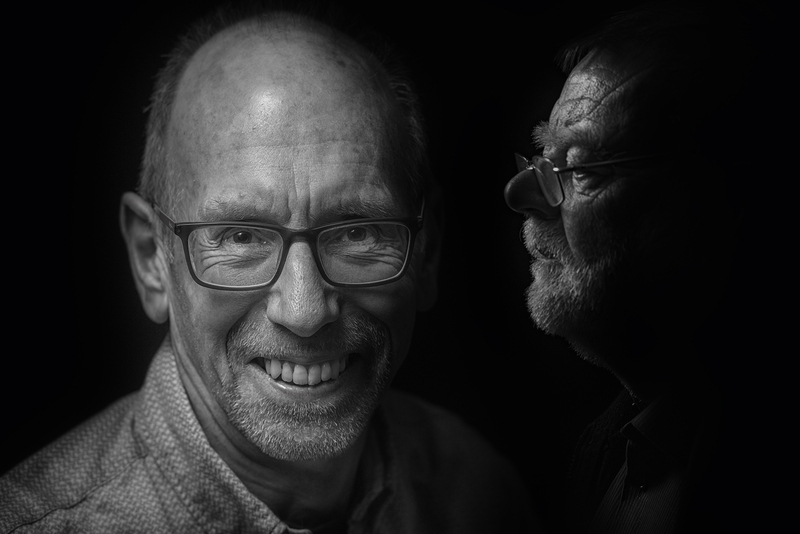 On the evening of Monday 7th January we had one of John Gardner’s Lights Nights but this time with some very different models – David Kershaw and Nigel Hazell our outgoing and incoming secretaries! In actual fact the model John had booked for the evening backed out at the last minute so John had to have a rethink. As it turned out it was a very good evening indeed. One of the regular comments some members make to John goes along the lines of “It’s all OK if you have big lights and all the accessories, but what about me with one flashgun? What can I do?”. Do John took up the challenge using just one typical speedlight. a stand (which could be your tripod) and a cheap white umbrella. As usual John kicked off with a clear explanation of what was needed and why. Of paramount importance was getting the flash off the camera to control red-eye and shadows in the background, hence the stand. The light needs to be diffused hence the umbrella. Obviously John gave everyone far more detail and answered the many questions. As both “models” were men John chose to sight-light them to bring out their “rugged good looks” (pardon!!?). It emphasises lines and gives harsher shadows so you wouldn’t normally use the setup with ladies. John concluded by taking a series of shots of both David and Nigel to load onto his laptop during the break. In the second half John went through his use of Lightroom and Photoshop to process the images he captured before the break, projecting the laptop onto the large screen. We all saw the starting images and John took us through the various adjustments he made to get the image he wanted. These were mainly slight global adjustments to start with and then some lightening of some parts and then darkening of lines and shadows to give more depth. All of them were quite straightforward but the overall effect was quite remarkable. A final sharpening in Photoshop and the job was done. You can see the before and after images below. The evening proved to be a great success with everyone thoroughly enjoying it and learning all sorts of things. 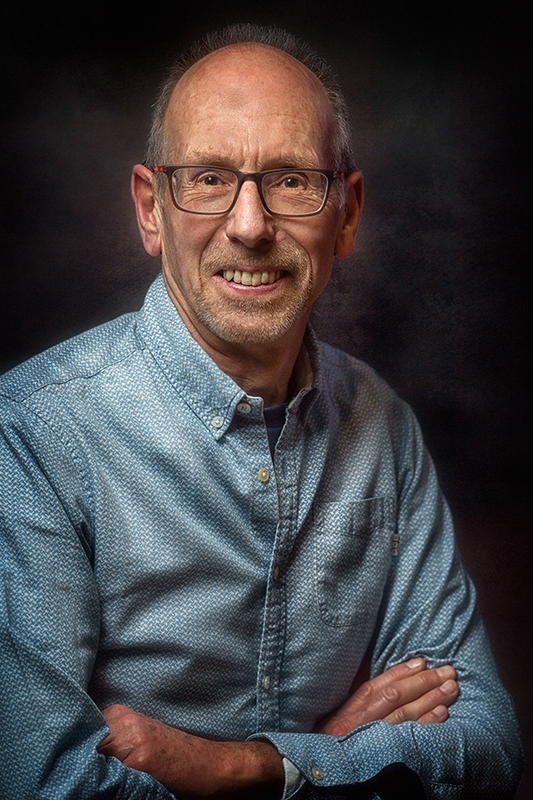 It really did show what you could do with a simple and cheap lighting set up (the brolly cost less than £8) and then a few adjustments easily achieved in software (although it helps to have the skill to get a great initial image!). Thanks John for turning your problem into a great start to the year. Wishing your life away Nigel? It was 7 January not February. I’m sure I’m not the only one to mention this to you.